New item! Supersprint has revised this item to build it from true 409 stainless steel! The mild steel version has been discontinued. Click here to be taken to the new stainless E36 muffler. Supersprint's cat-back performance muffler is a great sound and performance upgrade at an awesome price for the 325i and 328i. 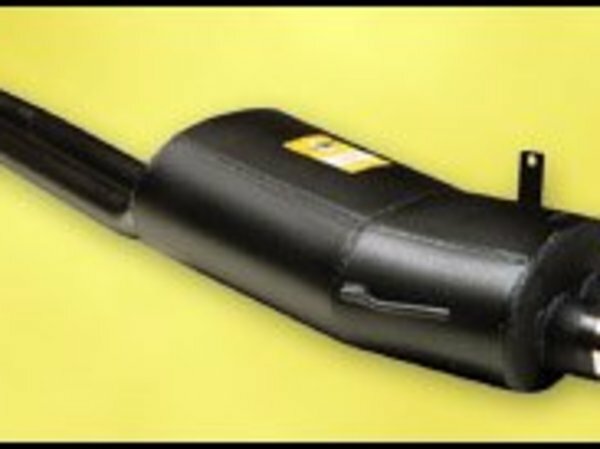 This sport muffler is more like an M3 muffler upgrade for your E36. It features a deeper and throatier exhaust note with more rumble. It's much better than what a stock muffler sounds like and a perfect complement to any other performance modifications you have made. It bolts to the stock catalytic converter, or Supersprint center section, or Track Pipe for an easy install with the factory hangers and gaskets.